How Does Dyslexia Affect Learning? Dyspraxia Symptoms in Children – Clumsiness may be a brain disorder. Who Can Diagnose Dysgraphia? And What Exactly IS Dysgraphia? Do You Have a Dyscalculia Diagnosis? Being chronically late is a sign. Speech Pathologist vs. Speech Therapist – Apples or Oranges? Physiotherapist vs. Physical Therapist – Are they one and the same? Special Needs Occupational Therapy – Fine vs. gross motor skills is the drill. Fine Motor Skills Toys – Will a Toy Help or Not? Support for reading will in time open doors to accomplishments. This is another of the identifiable brain-disorder learning disabilities. Apparently it involves accessing “working memory”. What in the world does that mean? Here’s what is happening! When a child has taken information in through their senses that information goes into the memory bank for later use. Then when tasked to write something from their short or long-term memory the access to this information has apparently been compromised which results in a mess when it comes to getting it into written form. What does dysgraphia look like for a person who has this learning challenge? If your child struggles to hold their pencils and crayons correctly, if as a pre-schooler they appear to hate drawing and coloring, or as school age child their writing is mostly not legible, or as a teen they only write in short sentences and don’t seem to understand grammar, at any age they have trouble forming their letters and putting them onto a paper’s line, it could very well be they have this impairment that involves written expression. Notice the grasp this little guy has on his pencil. It takes practice to learn a pinching grasp. So, what if they do not spell words correctly and find it frustrating to put their thoughts onto paper? The likelihood is they are working really hard. Think of it this way; the written form of expression requires that thoughts stored in their brain, be able to be pulled back out in an organized fashion in order to turn a thought into a written form. This requires allot of processing in their little brains. Being able to correctly hold writing and coloring instruments is an important skill. Address these concerns as soon as you can. The sooner someone is helping them with this disability the greater their successes will be in school and yes, in life. • If your child finds it hard to write a simple list or to button their clothing, they may have dysgraphia. • If your child is falling behind in school, doesn’t take notes on school work, and avoids writing assignments, they may have dysgraphia. • If your child is often frustrated by school expectations or situational changes, if their self-esteem is low or plummeting, if their teachers say they have sloppy handwriting or are lazy, and if it seems to you it is hard for them to get and keep friends, they may have dysgraphia. There are many aspects of brain-processing that are posing a problem. Consider that they may be having visual-spatial difficulties, fine-motor difficulties, processing language when it comes to following directions or the rules of a game, they may lose their train of thought, have problems with use of grammar, spelling, and composing something on paper, it’s as though their thoughts just won’t come together. Can you imagine how terribly frustrating this must be? And sometimes, this learning disability isn’t diagnosed until well into middle school, if ever. Developing the skills to be an effective student may take time but can be done. Now here is something you should know because receiving services, the critical assistance your child may need to work through this learning disability, could hinge on properly identifying this condition. And I will say it again, the earlier the better! The Diagnostic and Statistical Manual of Mental Disorders does not use the term “dysgraphia”. But it most certainly acknowledges the presentation of this problem. In the manual, they use the term “an impairment in written expression” which is entered in the category “specific learning disorder”. And in the law requiring “special education” the term dysgraphia isn’t used either. This brain disorder is described in a category, “specific learning disability”. Look this really is important. If your child is struggling with written expression, having trouble understanding language that is spoken or written, this is going to hinder their progress in school. You will need to have an IEP for them or provisions made for their education under the requirements of the 504 laws. You may have to take a firm stand in their behalf! Your child or teen is NOT lazy, they are struggling and maybe have gotten discouraged, but they are not a lazy or poor student! A happy teacher with her happy students! So…if you are hitting a brick wall with school staff, if you are not satisfied with the results of the school psychologist’s assessment, then have your primary care Pediatric Physician give you a referral for a psychologist or a Developmental Pediatric Physician. These folks are the “specialist” you need in your corner. And be aware that they are usually very busy so getting into their schedule can be a long process. Because they are intimately familiar with the ream of learning disabilities these specialists will positively move things forward in school. A doctor’s diagnosis is a powerful motivator and impetus to ensure services are in place. What are the Dysgraphia Tests? An academic assessment is conducted and their ability to handle their writing instruments, the fine motor skills needed for writing, and assess how their written expression evolves onto paper. It is going to entail writing and copying something that will be evaluated not just for the content of the paper, but how they conducted the writing. Even their posture is evaluated along with how they hold their writing instrument, if they become fatigued, or if they get writer’s cramp. The fine motor skills are tested with a finger tapping and wrist turning exercise. These assessments help to narrow down if the problem is this particular brain-disorder. What ‘Dysgraphia Help’ is Available? In the school environment, think accommodations, modifications, and remediation. These are approaches that are instituted in consideration of how your child or teen is learning. It may entail typing on a keyboard rather than writing things out. Or may mean the teacher modifies expectations on assignments, allowing for shorter papers or test questions that more closely match the thought processing issues they face. Also having an occupational therapist consistently working with the student will improve hand-eye coordination or muscle strength for writing and most certainly plays a large part in the student’s success. Assistive devices like this special keyboard can make a big difference for some students. And you can help them at home too. Just keep frustration at bay for both of you and look for tools that facilitate their success, things like pencil grips, and a spacer for when they are writing so words don’t run together. Let them have fun writing on the table by covering the table with plastic and covering the plastic in chocolate pudding or maybe shaving cream and have them write their letters in the pudding. The more they practice writing the better and feeling the movement of a letter in pudding will in time transfer to moving their hands and arms when holding that pencil to write. And here is something really important to consider. Start and keep a list of your observations on how they are doing and what they are doing. This can be used to communicate your concerns to whatever professional does an assessment. It can make a huge difference in getting a diagnosis because of your clarity from your intimate knowledge of your special person. Is Your Child, Young Person, or Teen dealing with the symptoms of Dysgraphia? My little one is just in the first grade and I have to say that I believe we will in time substantiate she has dysgraphia. She struggles to hold her pencils and crayons, writes squiggly very light lines, and does not yet copy letters of the alphabet. She is only tracing letters of her name, and doesn’t seem like she has the strength to push a pencil down onto her paper. She does not like to color, and when she does it rarely is inside of the lines. And even now, after years of working with her, she will sometimes seem confused as to which is her predominant hand. I will be discussing these things with her Pediatric Developmental Physician on our next office visit. What about you? How can I help? Let Me Know What Are Your Concerns? You Can Contact Me Here with your questions and I will get back to you as quickly as I can. 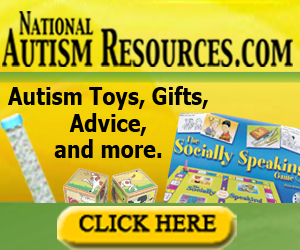 I am happy to introduce you to the National Autism Resources organization. They have a host of items that can support your efforts. Check them out and see for yourself! Sleep is so important and sometimes a struggle. This is the product that my daughter and I are using. There are many others and other companies that I also trust but this one is working for us! Why not give this a try. Of course, after you have consulted with your Pediatric Developmental Physician. Ours recommended starting at 3 mg as a beginning dosage. You may even want to try the cream I've listed here, especially if your child has difficulty chewing and swallowing. You Save: $8.25 This is the cream. The skin is the largest organ of the body and absorption of a product is a good route for getting it into the bloodstream and on its way to the brain. ALARMing that up to 8,000 still-births occur each year. If you are pregnant be sure you have a sonogram done and the physician is checking on the umbilical cord integrity. While melatonin is a natural supplement, I DO NOT recommend it when you are pregnant unless you have consulted with your physician. Download this KOBO 'ereader' book. Learn why your regular prenatal doc visits are important as related to the circadian rhythm and your unborn child. Keeping our little one’s digestive system in balance is VERY important. Look … this cereal has both DHA and probiotics, a great combination for better health. I wish a product like this was around when my kids were young (they are all in their 30's and early 40's now). When they have had to be on an antibiotic, this can help restore the good 'flora' in their gut, besides maintaining it as you go. You Save: $1.16 Adding a probiotic supplement is a good practice. Consider trying one of these. I Continue to Learn So Much When it Comes to Special Needs. What I Share Here in My Blog I am Learning to do from This Online University. There are classes, yes, and doing the lessons and related tasks develops in real time a blog, my blog. What's awesome and unexpected by many is the supportive community while you are learning and growing. I say...go check them out. This could be something you do too!